This year Fisheries brought on Jeff Schaeffer to become chief science editor. Jeff is a research fishery biologist with the U.S. Geological Survey (Ann Arbor, MI). He has a B.S. in Fisheries Management, an M.S. in Zoology, and a Ph.D. in Natural Resources from the University of Michigan. Jeff has successfully established a mechanism to ensure and maintain the scientific integrity of the magazine. With his broad background in fisheries science, he has strengthened the review process, study- ing submissions for suitability, content, and potential member interest, and carefully screens and vets potentially controversial content prior to publication. Jeff is now responsible for maintaining communication for all editorial disputes, rejected articles, comments, and responses. He has not only added sound science to the editorial process but has offered good guidance and suggestions to the managing editor. Together, they collaborate to publish a magazine with a beautiful dual nature as both a high-impact peer-reviewed journal for timely topics and as a voice for members to share ideas and accomplishments. While working to keep these traditions, they continue try to embrace a modern look. • Sent a letter to Interior Secretary Ken Salazar expressing support for the recent conservation and rehabilitation proposal for the ecosystem rehabilitation, including dam removal, for the Klamath River Basin. • Signed a joint letter (along with The Nature Conservancy, The Wildlife Society, the National Wildlife Federation, Trout Unlimited, and other important societies and associations) to President Obama urging swift action to restore the Clean Water Act protections for wetlands, lakes, and streams. • Signed a joint letter of support (along with the Association of Fish & Wildlife Agencies, the Association of Zoos & Aquariums, the National Audubon Society, The Nature Conservancy, The Wildlife Society, and other important societies and associations) for the State and Tribal Wildlife Grants Program. • Had the membership vote to adopt another AFS Policy Statement on Lead in Sport Fishing Tackle at the end of 2012. • Updated existing polices on topics such as surface mining, bycatch reduction devices, and commercial aquaculture via the Resource Policy Committee. • Established an ad hoc committee, Hatcheries and Management of Aquatic Resources, to reengage the AFS in addressing current issues related to hatcheries and their roles in aquatic resource management. • Was honored when Discovery World and the U.S. Forest Service partnered to mentor a Hutton junior fish biologist. • Introduced members to the theme of social media, addressing how it is used along with spotlighting members who use it. • Joined other AFS publications in updating rules on the spell- ing of common names of fish (and we encourage our members to use the complimentary fish name spell-checker found at fisheries.org/fishnames). • Introduced the first in a series of themed issues, beginning with the May 2013 Sturgeon issue. • Published one of the first “fracking” articles by a fisheries scientist, Maya Weltman-Fahs, with her manuscript entitled: “Hydraulic Fracturing and Brook Trout Habitat in the Marcellus Shale Region: Potential Impacts and Research Needs” (Maya Weltman-Fahs and Jason M. Taylor. Fisheries Vol. 38, Iss. 1, 2013). • Began to focus Spotlight articles on (1) our newest members and (2) our celebrity members (although all of our members are celebrities to us), starting with Rick Hansen, best known for his “Man in Motion” World Tour. BRAVO TWIN CITIES—HOWDY LITTLE ROCK! Kudos to the Minnesota Chapter of the AFS who, in partnership with the Minnesota Department of Natural Resources, set up local arrangements for the AFS 142nd Annual Meeting, held in the Twin Cities last August. Over 1,550 members from 19 different countries attended the meeting that focused on Fisheries Networks: Building Ecological, Social and Professional Relationships. Plenary speakers included Dr. Villy Christensen, Professor at the UBC Fisheries Centre, who gave a lecture on “Ecological Networks—From Who Did It to Future Food Webs;” Dr. Barbara A. Knuth (Past President of the AFS), who focused her lecture on “Expanding the Reach of Fisheries Science and Management through Strategic Social Networking;” and Dr. William W. Taylor (also a Past President of the AFS), who gave his talk on “Fisheries Sustainability: The Science and Art of Coupling Human and Natural Systems.” We look forward to our next meeting, to be held this September in Little Rock, Arkansas, where papers and symposium will be presented and a great, southern time is expected to be had by all (afs2013.com). The beginning of this year was a turning point for Fisheries and the AFS. The month will bring another transition when a new AFS president (Bob Hughes), a new executive director (Doug Austen), and several new members of the Publications Overview Committee come on board. We hope to bring as many people as possible together in Little Rock to begin a focused discussion of the future of Fisheries—what is going well and what we can do better to present our Society to the world. The American Fisheries Society (AFS) membership journal, Fisheries, offers up-to-date information on fisheries science, management, and research, as well as AFS and professional activities. Fisheries features peer- reviewed scientific articles, analysis of national and international policy, chapter news, job listings, interviews with prominent professionals (as well as new members), archived content dating back to the beginning of the AFS, and more. Fisheries gives AFS members the professional edge in their careers as researchers, regulators, and managers of local, national, and world fisheries. Fisheries is available to members online at www.fisheries.org. The Fisheries InfoBase now includes all AFS journals back to 1872, including the complete contents of all issues of Fisheries. Our new online bookstore at www.fisheries.org/shop now offers digital downloads of many books or just their individual chapters. Congratulations to the 2012 American Fisheries Society (AFS) Award Recipients, who were announced during the AFS Annual Meeting in Saint Paul, Minnesota, this past August. They were honored for their contributions to the AFS, to their profession, and to resource conservation. Natural mortality in relation to age and fishing mortality on walleyes in Escanaba Lake, Wisconsin, during 1956–2009. North American Journal of Fisheries Management 31(3):506–514. • S.T. Lindley et al. Electronic tagging of Green Sturgeon reveals population structure and movement among estuaries. Transactions of the American Fisheries Society 1:109–122. Quantitative polymerase chain reaction (PCR) for detection of aquatic animal pathogens in a diagnostic laboratory setting. Journal of Aquatic Animal Health 23(3):148–161. • Jesse Trushenski, J. Rosenquist, and B. Gause Growth performance, tissue fatty acid composition, and consumer appeal of Rainbow Trout reared on feeds containing terrestrially derived rendered fats. North American Journal of Aquaculture 468–478. • Honorable Mentions: Hillary A. Meyer, South Dakota State University and Joshua W. Morse, Oberlin College. • Iowa Department of Natural Resources, Project: Urban Fishing Program Development and Case Study–Fish Iowa! • Muskies Canada Inc. and Muskies Inc.
• Jeffrey F. Bromaghin, Danielle F. Even- son, Thomas H. McLain, and Blair G. Flannery for their paper “Using a Genetic Mixture Model to Study Phenotypic Traits: Differential Fecundity among Yukon River Chinook Salmon, Transactions of the American Fisheries Society,” Transactions of the American Fisheries Society 140:235–249. 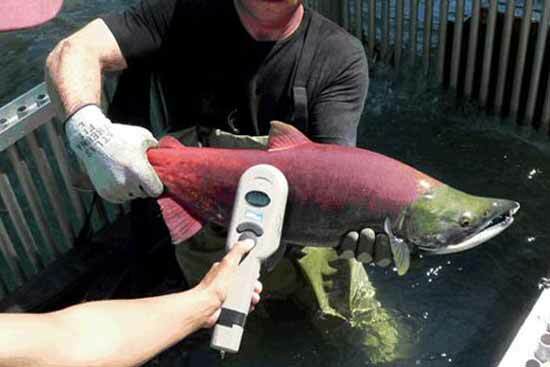 • Northwest Marine Tech, Inc.
Advanced Telemetry Systems Inc. AIS Inc.
Alaskan Observers Inc. Alpha Mach Inc.
Analytical Environmental Services Aquatic Eco-Systems, Inc.
Colville Tribes Fish and Wildlife Department. Floy Tag & Manufacturing Co.
CONGRATULATIONS TO THE HUTTON JUNIOR FISHERIES BIOLOGY PROGRAM CLASS OF 2013! Mentor and Student Applications for the 2014 Hutton Program will be available online in October. For more information about the Hutton Program, please visit HUTTON INFO or contact Beverly Pike at 301-897-8616 ext. 213 or via e-mail: [email protected].